The original dream of the paperless office has faded some in recent years. We're at least 20 years into the digital revolution (or longer, depending on when you started counting), and the typical workplace is still drowning in paperwork. Since you can't seem to escape paper entirely, you might at least want to avoid storing it for years on end. OfficeDrop is a paperless office service that helps you ditch your file cabinets for the cloud organizing your papers for you on the Web. Like Dropbox on steroids, OfficeDrop is a multi-user service that includes customized scanning software for Windows, Macs, and Android phones. While there's no iOS version of the scanning app, there is an iPad app that lets you organize, search, and view your documents. 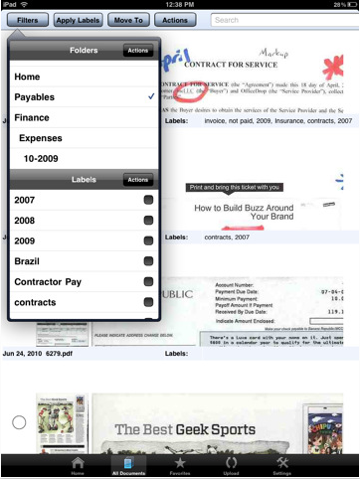 The OfficeDrop viewer for iPad lets you organize, search, and view your uploaded documents. When you scan a document to OfficeDrop, it saves the contents as a searchable PDF of the page. You can upload a wide range of common file formats, as well. Once their in OfficeDrop, you can search for any phrase and OfficeDrop will locate any matching files for you pretty much instantly. A basic account runs $10 per month and comes with 10GB of storage. For $20 per month, they'll give you envelopes you can use to send your documents to them and scan 50 pages per month for you. At the high end, they'll scan 150 pages per month and give you 60GB of storage for $99 monthly. All account levels let you scan as many of your own documents as you like. My main criticism with OfficeDrop is that its storage capacities are fairly skimpy for a service that purports to deliver the paperless workplace. 60GB (let alone 10GB) just isn't enough storage to tackle all the paper in a typical small business's filing cabinets. And companies that are required to keep large quantities of paperwork for regulatory purposes will never be able to trust all those documents to such a small cloud account. But if your company is fairly small and you're more interested in digitizing new documents than in uploading all your archives, OfficeDrop can be an affordable way to break free of your paper chains.